Log into our Billing and Support System at https://www.mddhosting.com/support/login.php. Click "Services" in the blue navigation bar and then "My Services" in the drop-down menu. Click on the status of the service you wish to cancel. 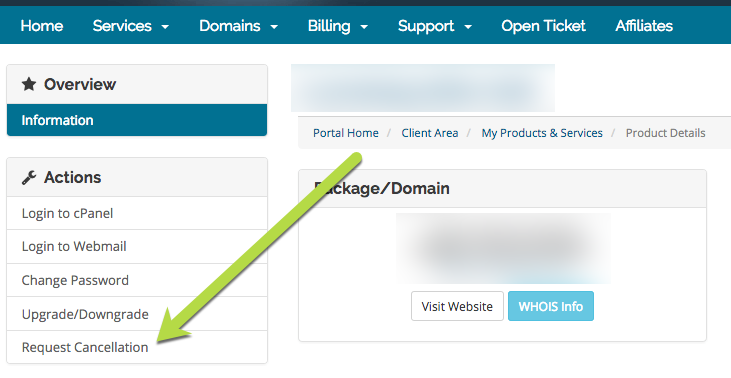 Click the "Request Cancellation" link at the bottom of the "Actions" menu to the left. Briefly describe your reason for canceling the service. Choose your "Cancellation Type" - "Immediate" or "End of Billing Period". If the main domain of the account is registered with us you will also be given the option to disable auto-renew for the domain. You will receive an email to the primary email address on file with the subject "MDDHosting - Cancellation Request Confirmation." If you do not receive this email please make sure to check your spam or junk folder. In the event that you believe you have not received this confirmation and you have checked your spam and junk folders, please get with our billing department to ensure your cancellation has been received. Please note that we do not accept cancellation requests via e-mail or support tickets. All cancellation requests must be submitted via the support system. We may request further identification verification in some circumstances in order to protect your account from being canceled by an unauthorized third party. How do I upgrade my plan? Is there any downtime if I upgrade?